While flaky pastry is somewhat easier to process, it produces a lower volume after baking. Therefore, it is not a good substitute for traditional puff pastry applications such as vol-au-vents or bouchees but is more suited for pie crusts and turnovers. How is flaky pastry made? A flaky pastry is best described as a dough sheet dotted with multiple spots of fat between laminations. This arrangement forms a dough with discontinuous fat layers which bake up into a crisp and flaky pastry structure. Some bakers argue that ‘blitz’ or ‘rough puff’ pastry, in essence, belong to the flaky pastry type.2 The difference being that blitz puff pastry incorporates a block of fat that is rolled and sheeted to create layers. 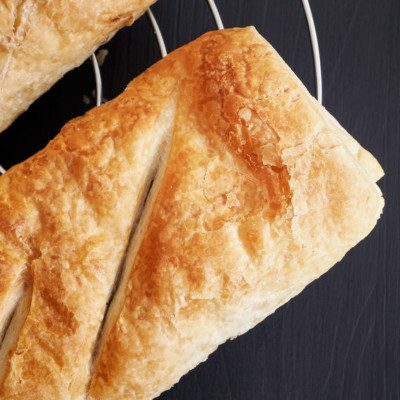 Although flaky pastry formation requires “turning” or “folding”, it is more of a hybrid between traditional pie dough and puff pastry, which requires a much shorter production time. The process of making a flaky pastry involves “cutting” one quarter of the total fat into the flour such as a pie dough till it forms what resembles coarse meal. Proper incorporation of the fat, in this step, provides flour lubrication and restricts or at least delays its quick absorption of added water. Subsequent hydration and mixing result in a dough ready for lamination. Mix dry ingredients with one-fourth of the cold butter (cubed) on low speed till a meal-like dough is formed. Add liquids and mix till a rough dough is formed. Do not overmix. Resting of dough for about 20 minutes. Sheeting of dough to desired thickness. Laminating into 4 single folds. Between each fold, dot the dough sheet with a third of the remaining fat before laminating. Allow the dough to rest in a refrigerator or retarder for 15–30 minutes between successive folds. Once the four folds have been completed, the dough is then sheeted down to the required thickness. Alternately, the dough can be frozen for extended periods of time before use. Small changes in ingredients such as flour, fat (type and concentration) and processing method can determine the type of a pastry dough. Varying the amount of fat and its distribution (sheet vs. dots) can produce products with a broad range of texture, taste and application (i.e. from puff pastry to rough puff pastry to flaky pastry). Similar results can be obtained by varying the type and flour as well as the lamination process. The bakery must ensure that the dough is properly mixed. Overmixing can lead to the fat’s complete incorporation into the dough resulting in loss of functionality. Similarly, undermixing can lead to underdeveloped dough which lacks consistency. Low temperature (10–20°C) should be maintained in the production plant to prevent the fat from melting or becoming too hard to mix and sheet. Ensure that the dough is rotated 90° after each lamination to reduce stress on the dough. Jones, Bridget, and Robuchon Joël. “Puff Pastry.” New Concise Larousse Gastronomique: the Culinary Classic Revised and Updated, Hamlyn, 2007, p. 938. King Arthur Flour. “Flaky Pastry Recipe.” King Arthur Flour, www.kingarthurflour.com/recipes/flaky-pastry-recipe. Accessed 24 October 2018. Ortiz, D.E. Cakes, pastries, muffins and bagels, In: Encyclopedia of grain Science. 2004, Academic Press, pp. 1700.